Landlord tenant law in the state of New York protects specific rights of tenants in the state. An important set of rules included in these laws involves the security deposit. Here are eight basic rights every tenant should know. In general, New York does not set a limit on the maximum amount a landlord can charge a tenant as a security deposit.The landlord can charge whatever a tenant is willing to pay. Rent stabilized apartments may have different rules. In these apartments, landlords are only able to collect a maximum amount equivalent to one month's rent as a security deposit. An exception to this rule is if the security deposit terms were put into place before the unit became rent stabilized. In these cases, the landlord and tenant must follow the original security deposit amount until the termination of the lease, as long as the security deposit was not more than two months' rent. Are Nonrefundable Deposits Allowed in New York? In New York state, security deposits are always considered the property of the tenant, so it is illegal for a landlord to try to collect a security deposit that cannot be returned if the tenant follows all the terms of the lease. n the state of New York, the security deposit is always considered the property of the tenant. The landlord is responsible for placing this deposit in a trust for the term of the lease or rental agreement. New York landlords must store a tenant's security deposit at a banking institution that is located within the state of New York. The deposit cannot be combined with any personal money of the landlord and the landlord must not attempt to use the money from the security deposit as if it is his or her own. If a landlords has a rental property with six or more units, the tenants’ security deposits must be placed in an interest-bearing account. The account must earn interest at a rate that is equivalent to the interest rate for similar deposits in the area. Landlords who own rental property with fewer than six units are not required to place a tenant’s security deposit in an interest-bearing account. Landlord- If security deposit earns interest, the landlord is allowed to collect an annual fee equal to one percent of the security deposit. -Hold this money for the tenant in the trust until the end of the lease. -Put this money toward the tenant’s rent. -Pay this interest to the tenant each year. Additional breaches of the lease agreement. Is a Walk Through Inspection Required in New York? No. Landlords in the state of New York are not required to perform a walk through inspection prior to a tenant’s move-out. 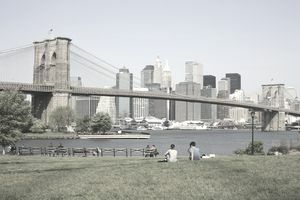 Landlords in the state of New York must return a tenant’s security deposit at the termination of tenancy or within a “reasonable time” thereafter. The law does not specify an exact number of days. If an investment property is sold or otherwise changes ownership, the landlord must do two things within five days of the transfer of ownership. The Name of the New Owner/Owners. The Address of the New Owner/Owners. Different rules may apply if a property has been foreclosed on, so you should seek legal counsel if your property has been foreclosed on or if you are buying a foreclosure to determine the appropriate actions. What Is New York's Security Deposit Law? For the original text on security deposit laws in the state of New York, please see New York General Obligations Law §§ 7-103 to 7-108.